DRC is almost never on the news, but in 2017, it was one of the world’s most troubled countries. In July, the UN reported the discovery of over a dozen mass graves in the Kasai region, filled with those slaughtered in the conflict between soldiers and local armed groups. "Kabeya Mamba Michele, male victim of violence, 30 years old described the horror: “I know many people – women, men and children – who have been murdered. I can’t even count how many. They were buried in mass graves of 30 or 40 people together, just in front of the houses. My own house was burnt down." People fled the violence and hid in the forest for weeks on end. Some were brutally raped. "As the family fled their home, her father was caught by five militiamen and beheaded in front of them. The girl was raped by at least three of the militiamen, who left her for dead." "Kanku, displaced woman, 21 years old: After the violence started up, we decided to stay in the woods. At one point I was separated from my husband. Each of us was carrying one child, but my husband was shot down. I stayed for a month in the bush." With hundreds of thousands of people forced from their homes, the survivors are suffering malnutrition and are exposed to diseases such as malaria. 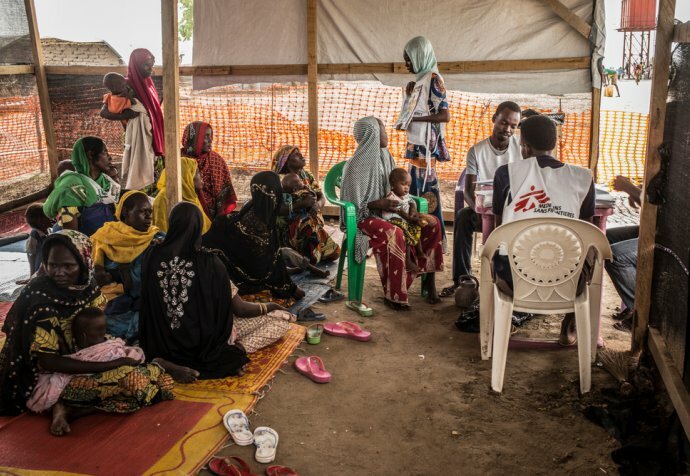 MSF teams have performed dozens of emergency interventions, tackling outbreaks of measles, yellow fever, cholera and typhoid fever, and helping women that have been raped. Have you even heard of the Central African Republic? You’re not alone; few people know about the Central African Republic (CAR), but its four million citizens definitely deserve attention. Since late July 2017 fighting between the Muslim and Christian religious factions has set the country on fire. 600,000 have fled violence. 60,000 people have crossed into the Democratic Republic of Congo, which shows their sheer desperation (see news story number 1). People are seeking refuge in hospitals, churches and mosques. In July, 7000 of people sought safety in an MSF hospital in Zemio. On 11 July, two armed men arrived at the hospital, threatening a patient’s family. As the family – including a woman holding her baby – attempted to seek cover, the armed men shot at them, striking the child in the head and killing her instantly. This attack, along with a series of attacks on MSF staff and hospitals, forced MSF medical teams out of some areas, leaving many people without medical help. Can you imagine a country where hundreds of health facilities have stopped functioning due to airstrikes and shelling? Can you imagine Australian and New Zealand medical staff still coming to work without having received their salary for a year and completely lacking drugs and medicine? After almost three years of conflict, it is estimated that over 10,000 people have been killed and families are struggling to meet basic needs. This year, over half a million Yemeni got cholera – a disease considered to be ‘cured’ by much of the developed world. On top of all that, in November the Saudi-led Coalition blocked humanitarian organisations like MSF getting into Yemen to provide food and medicine. And according to analysts, there is no end in sight for the Yemen war. And how many times did you see Yemen on the news? You might have heard about the Nigerian schoolgirls that were kidnapped in 2014 from the #BringBackOurGirls campaign championed by Michelle Obama, but did you realise that the civil war in Borno State Nigeria is still ongoing after more than eight years? The war has forced 1.7 million people from their homes. Tens of thousands of Nigerians remain heavily dependent on aid for their survival and are experiencing food shortages and experiencing severe malnourishment. MSF has little information about the needs in these places but understand that limited medical care is available. As a medical humanitarian organisation, MSF is deeply concerned about the people living in these places. We are providing medical care to vulnerable groups, including women during pregnancy and childbirth. Our teams are running nutrition programmes for children, providing mental health support, responding to disease outbreaks and providing emergency paediatric care.